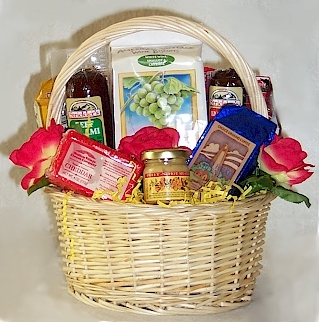 A lovely Basket of Gourmet snacks is a great gift. This small basket is overflowing with gourmet goodies. From the wine biscuits to the coffee, gourmet beef sausages and real cheddar cheese you'll love the flavors we've brought together. Yes, there are cookies too but keep it under your hat or everyone will want some!